For the past few months, in between other things, I’ve been working on Featherweight Cardigan by Hannah Fettig. It’s a very straightforward top-down raglan, but unusually, knitted in a loose gauge with lace-weight yarn on 4 mm needles. It has felt like slow going, but this is probably more due to the lack of knitting time I’ve had than it being a substantial project. It’s knitted with aran weight left-overs on 4.5 mm needles (I find fairisle easier on a tight gauge) using charts from ‘BMP’ sock pattern on Knitty. I arranged the space invaders in classic arcade formation, allowing a bit of artistic licence. 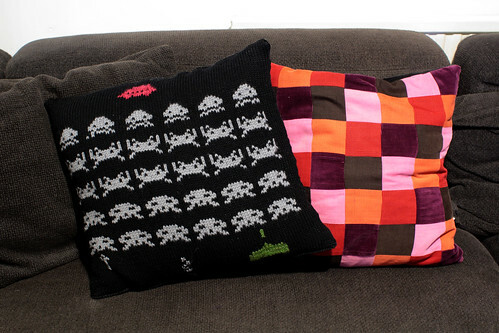 For a bit of 8-bit inspiration, take a look at the Happy Seamstress’ Nintendo crafts competition, wow.